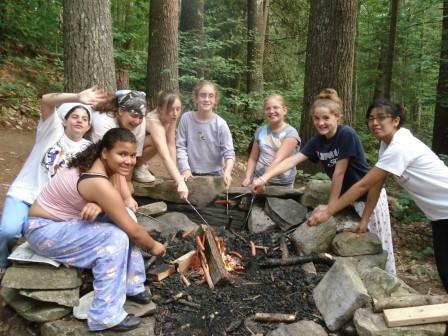 The Summer Camp leases a fifty acre site from Medomak Camps on Washington Pond in Washington, Maine. Camp buildings include a dining hall, a two story multipurpose building (home to our dance, pottery, and arts and crafts activities) and a variety of smaller cabins including: seven sleeping bunks, wash house, rustic library, nurse’s cabin, photography cabin and our small camp office. On-site there are tennis, basketball and volleyball courts, a small playground, an archery field, a wilderness tenting site and a waterfront that includes a pontoon boat, sailboat, canoes, kayaks, and stand-up paddle boards.